Operation Appreciation 2014: The Mission Begins! 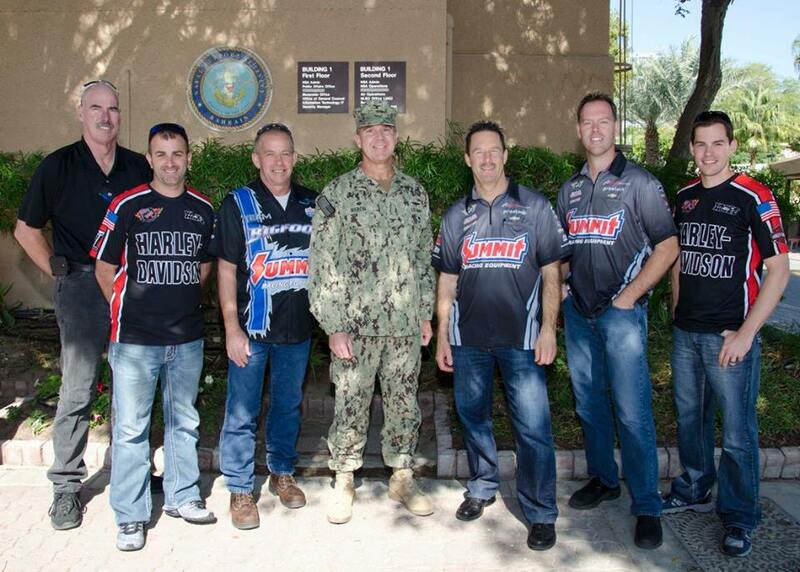 For over a decade, Summit Racing Equipment has been involved in “Operation Appreciation,”—taking racers overseas to meet and visit with the U.S. troops stationed there. This year is no different, with an all-star returning cast of champions that includes Greg Anderson, Andrew Hines, Eddie Krawiec, Jason Line and Dan Runte. Each year they have also brought along a team correspondent or reporter to keep everyone up to speed on the travels, and adventures that go into this very special event. And this year that is going to be me, so I thought I would introduce myself. I’m Alan Reinhart. If you follow NHRA racing, you may know me as the lead announcer. When I was invited to participate this year with the guys, I jumped at the chance. Dealing with the NHRA racers on a weekly basis, I have heard many stories about past Operation Appreciation trips, and it took me less than the average margin of victory in a Pro Stock race to say “Yes!” So arrangements were made, and I’m on the team. Saturday was travel day #1, and it was an adventure in itself. The travel plans had us all flying into Washington D.C. and then on as a group to the first stop which this year is Bahrain. And even that was not without its drama. Greg and Jason had the shortest commute, just flying up from Charlotte, NC. They were scheduled to be the last to arrive at Dulles airport and they were. What wasn’t scheduled was for the rest of us to be on the plane before their flight even landed! A late flight caused them to literally run through the airport and arrive just as the door was being closed. As you can surely imagine there isn’t a flight to Bahrain every hour so missing the connection would have been a big headache, but they made it, and here we are. One thing I learned on the 12-hour flight: Spending a couple of hundred bucks on movies to whittle away the time seemed like a great idea, but finding out my DVD player on the laptop is not functioning would have been something to check out before the trip (note to self, order a new computer). I did survive the longest flight I have ever been on and even caught a couple of winks. This is a pretty special group of people. They genuinely like each other and get along well. The quick-witted jabs fly nonstop and there’s no chance of getting away with anything. This trip is anything but an imposition for them. It is something they look forward to and plan for all season long. Please check back in every day or two and I will keep you up to speed on the trip. I’ve been looking forward to this for over six months and it’s finally here. I’ll do my best to share the experience with all of you. Great Alan. Indeed unfortunate that I could not make the trip. Oh well, there is next year.